ABOUT: Specialising in traditional baking methods, Phillipa’s passion is to create artisan breads, pastries and sweet treats, bringing a little taste of France to the UK. Branding for Phillipa’s Patisserie needed to reflect the authenticity of each exquisitely created product and echo her home-baking style, expressing the love, care and dedication she devotes to every batch. The logo is contained within a delicately shaped frame, with an inner border of dots to represent the fine detailing on many of the food goods. 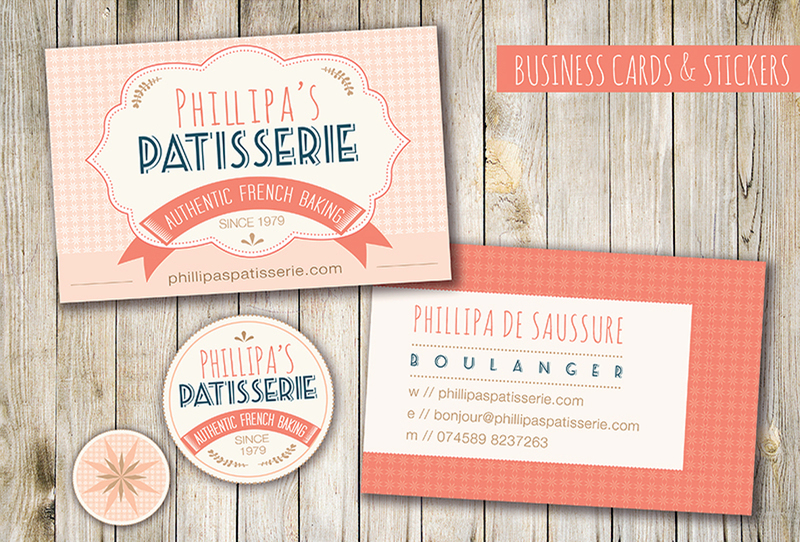 Phillipa’s name uses a hand-written font to give it that personal touch, whilst ‘patisserie’ uses a typically vintage French-style font. For a finishing touch a pattern has been created from small detailed segments of wheat, giving an overall pretty floral, checkered effect, like the linen you may find in a French boulangerie.